The MeerCam XL GPRS Control Panel Model is a wireless, battery operated security system control panel. The MeerCam XL GPRS self powered control panel is designed for residential and small commercial security applications where security video verification is needed or desired. The MeerCam XL GPRS control panel is powered by eight 1.5-volt alkaline batteries that last up to two years, with normal system activity. A built-in siren provides status beeps. The embedded cell/mobile modem communicator reports to the monitoring station and enables 2-way voice communication over the GPRS mobile phone network to a monitoring station or alarm receiving centre. With the embedded touchpad on the MeerCam XL GPRS Control Panel the user can arm, disarm the XL control panel system and review past events and system status. Under the TouchPad an integrated proximity card reader that can be used to arm and disarm the system without using the TouchPad. The proximity card/tag arming system is designed to maximize operator convenience. 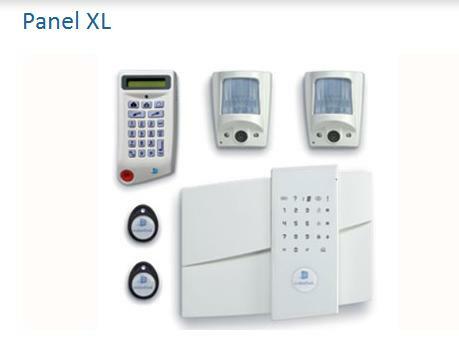 The MeerCam XL GPRS control panel, along with all Videofied battery powered security alarm devices – up to 19 Videofied security devices, utilize Patented S2View® - Spread Spectrum, Interactive, AES Encrypted Wireless technology, providing optimum wireless signal integrity and security. Bi-directional RF communication paths between all Videofied security system devices and the system control panel assure high wireless and GPRS signal reliability. The MeerCam XL GPRS battery powered control panel supervises every Videofied security devices (excluding the remote key fob) to validate current open/close state, tamper condition, serial number, date of manufacture, firmware revision, and battery power strengtrh status.